The Apostle Paul’s epistle to the Christians in Rome has been called, “The Greatest Letter Ever Written,” a title not without merit, for this magnificent book is God’s guarantee not only of everlasting life, but also of complete freedom from the oppressiveness of sin to anyone who believes. All that mankind lost in Adam has been restored through Jesus Christ. The scope of this epistle is universal, but its blessings are immensely personal, for God tells us that, “whosoever calls upon the name of the Lord shall be saved.” These blessed truths have been a source of comfort and encouragement to countless Christians throughout the history of the Church. It is noteworthy that this argument takes two chapters to develop, due to two unfortunate aspects of fallen mankind: his denial of his own sinfulness and his self-justification. As Proverbs 21:2 tells us, “Every way of a man is right in his own eyes.” This was especially true for the Jew, to whom much of this opening section is devoted, and whose works-based application of the Law proved a formidable opponent to God’s grace. The subject then abruptly changes in verse 18, and God’s righteousness is not picked up again until Romans 3:21. The new topic embarked upon is that of God’s wrath. For the wrath of God is revealed from heaven against all ungodliness and unrighteousness of men, who by their unrighteousness suppress the truth (Rom. 1:18). This stands in stark contrast with much of what is taught about God by contemporary Christianity, but Scripture is clear: God is angry with humanity. His anger is manifested against the defiance and rebelliousness that they demonstrate towards Him, their Creator, when they conceal and obscure the truth. For what can be known about God is plain to them, because God has shown it to them. For his invisible attributes, namely, his eternal power and divine nature have been clearly perceived, ever since the creation of the world, in the things that have been made. So they are without excuse (Rom. 1:19-20). God’s witness that He alone is the true God is demonstrated to all mankind through the structure and order of those “things that have been made,” that is, His creation. It is through His creation that, as Acts 14:17 tells us, “[God] did not leave himself without witness, for he did good …” God reveals His goodness and faithfulness to man in the magnificent handiwork of His creation. Psalm 19 says, “The heavens declare God’s glory, and the sky above proclaims his handiwork. Day to day pours out speech, and night to night reveals knowledge … and there is nothing hidden from its heat.” This is a universal witness to all humanity that both His nature and his standards are righteous. Hebrews 9:27 says, “And as it is appointed unto men once to die, but after this the judgment.” Everyone will be called to give an account of himself to God. As such, God’s justice requires that He communicate to man the standard by which He will judge him. God does this through the witness of creation, and by doing so removes every excuse of man. No one can claim ignorance. This is significant when one considers that even in the heart of the most adamant atheist there is some comprehension of God and his goodness. For although they knew God, they did not honor him as God or give thanks to him, but they became futile in their thinking, and their foolish hearts were darkened. Claiming to be wise, they became fools, and exchanged the glory of the immortal God for images resembling mortal man and birds and animals and reptiles (Rom. 1:21-23). Our God sits on His throne, “high and lifted up.” When a man reveres Him and gives God His rightful place of honor in his heart, that man is also lifted up. Conversely, when man denies God His proper place, he descends spiritually and morally even as his heart grows darker and darker. “They are gone far from Me, and have walked after vanity, and are become vain” (Jer. 2:5). This pervasive darkness infects his reasoning, and in the blindness of his soul he imagines himself as wise even while God calls him a fool. Rather than worshipping the glorious Creator who made all things, man debases himself by worshipping images of created things, images that are of his own making. God created man to know, love, and fellowship with Him. This was his intended state. A godless existence is a perversion of this natural order. “The fool says in his heart, ‘There is no God.’ They are corrupt, and their ways are vile; there is no one who does good” (Ps. 53:1). The word “foolish” in the phrase “foolish heart” of Romans 1:21 can be translated undiscerning. Just as a person might find himself unable to recognize objects in the dimming light of evening, so it is for the person who has deprived himself of God’s light and is unable to distinguish between truth and error or right and wrong. Therefore God gave them up in the lusts of their hearts to impurity, to the dishonoring of their bodies among themselves, because they exchanged the truth about God for a lie and worshiped and served the creature rather than the Creator, who is blessed forever! Amen (Rom. 1:24-25). God has extended to every human being the freedom to choose his own destiny. As He testifies in Deuteronomy 30:19, “I call heaven and earth to witness against you today, that I have set before you life and death, blessing and curse. Therefore choose life, that you and your offspring may live.” It has always been a matter of choice. As God promises, when a man chooses to walk in the light as He, God, is the light, that man experiences the fullness of joy. When he walks away, however, and exchanges God’s truth for an illusion, God honors his choice. And by withdrawing himself from God, the man not only loses the truth about God but also loses the truth about himself. Everything becomes a lie. And so, yielding to his foolish and rebellious heart, and walking contrary to the expressed will of his Creator, man both dishonors his body and contaminates his soul. As Isaiah 44:20 says, such a man “… feeds on ashes; a deluded heart has led him astray, and he cannot deliver himself or say, ‘Is there not a lie in my right hand?’” He is blind to his own blindness. For this reason God gave them up to dishonorable passions. For their women exchanged natural relations for those that are contrary to nature; and the men likewise gave up natural relations with women and were consumed with passion for one another, men committing shameless acts with men and receiving in themselves the due penalty for their error (Rom, 1:26-27). It is amazing that even with what God clearly sets forth in Romans 1 about homosexuality, and the thorough indictment it receives, there are many Christians today who feel that a loving God must accept the homosexual relationship since it is simply another manifestation of “love.” This is a false and naïve point of view. If you hold this perspective, please consider this: If homosexuality is the benchmark God chooses to illustrate the extent of mankind’s separation from his Creator, how could God possibly approve of a homosexual relationship? Scripture clearly states that homosexuality is an abomination to God’s natural order. And since they did not see fit to acknowledge God, God gave them up to a debased mind to do what ought not to be done (Rom. 1:28). Such perverse behavior increasingly corrupts the soul. The final result is a mind, at one time aware of God’s righteous standards, but now completely devoid of any godly standard at all. This is mankind in his most miserable state and for which the fullest extent of God’s wrath is revealed. Chapter One ends with a panoply of the sinful behavior of those who sell out to ungodliness. They were filled with all manner of unrighteousness, evil, covetousness, malice. They are full of envy, murder, strife, deceit, maliciousness. They are gossips, slanderers, haters of God, insolent, haughty, boastful, inventors of evil, disobedient to parents – foolish, faithless, heartless, ruthless (Rom. 1:29-31). These are brutal truths, but this characterizes much of what man today calls “civilized.” In his play, Hamlet, William Shakespeare said the following about mankind: “What a piece of work is a man! How noble in reason, how infinite in faculty! In form and moving how express and admirable! In action how like an Angel! In apprehension how like a god!” Man being God is the illusion, the myth that man creates for himself. God, however, sees it differently. He describes mankind as foolish, faithless, heartless, ruthless, for without Christ this is mankind as he really is. With the downward cycle of man’s idolatry complete, Romans 1:32 says: Though they know God’s decree that those who practice such things deserve to die, they not only do them but give approval to those who practice them. Entire cultures have rejected God and have given themselves over to the lie. God’s sober verdict? They are worthy of death. Thank God He is a merciful God who is not willing that any should perish, but that all men should be saved and come to a knowledge of the truth. And so He withholds His judgment for now, but one day all men will account for how they lived their lives. 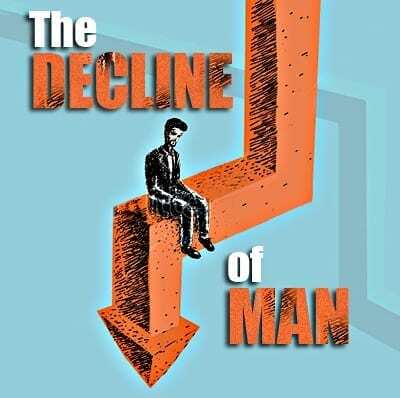 The decline of man is a breathtaking, sobering, and uncomfortable accounting of the behavior of our species. Romans 1 strips away the whole illusion that godless men hold of themselves and reveals with clarity how God truly sees them. As Jeremiah 17:9 tells us, the heart of man is “deceitful above all things and beyond cure. Who can understand it?” All the confidences that he holds for himself and his humanity are rendered utterly empty before the righteous God, the Creator of Heaven and Earth. The blessed comfort for the reader confronted with such darkness is its contrast to the exceptional goodness of the heart of our God, for it is He who rescues us from our misery through His Son, our Lord and Savior Jesus Christ, whose Name is above all names. In the Lord Jesus Christ, mankind finds his only Hope. Jesus alone is able to save us to the uttermost.